When you go to Cazucá, you will be surprised by the amazing and inspiring processes going on at a place with such a reputation. At the outskirts of Bogotá, Cazucá, a former hacienda, was colonized by displaced families from all over Colombia, 30 years ago, escaping from their violent homeland. The city dream they encountered was far different from what they where searching for, more like a nightmare, as Colombian armed conflict was represented, and experienced, at Cazucá. First colonized by the M19, a disappeared guerrilla group, these mountains where gradually inhabited by displaced farmers who found themselves in the middle of a cross fire between other illegal armed groups who where contesting the supremacy of the neighborhood, gangs, and the police. For years the news you could hear from Cazucá where terrible, stories abundant with death and despair. But amazing untold things where happening. Brave people, regarding the reality they where experimenting, dreamt, and fought for their dreams, transforming hostile deserts into oasis of hope. We had the opportunity to experience Cazucá through an amazing organization, Tiempo de Juego, which with the excuse of a football, works towards materializing the dreams of the children from this forgotten mountains. 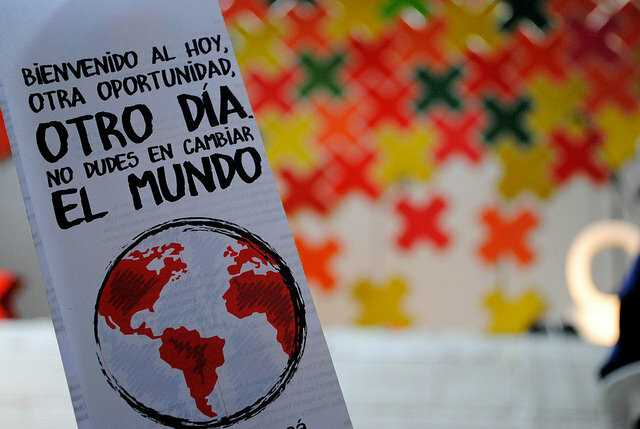 Founded 8 years ago, Tiempo de Juego began introducing the methodology of Soccer for Peace, starting with 15 children. Nowadays it serves more than 1,000 children, and its activities range from screening workshops, to a bakery making the snacks for the little soccer players, or a school hotel at Santa Marta. Watch one of the founders, Andrés Wiesner, TEDxBogotá talk here! We met Milton, a former gunmen from Cazucá who transformed his life and now, through and NGO called Ahmsa, supports and inspires local entrepreneurs with the power of changing their lives, their families, their neighborhoods, and hence, the world! Soon, the idea to organize a TEDx in the box at Cazucá started. Ahmsa and Tiempo de Juego joined forces with the mission to tell a different story about Cazucá and empower local ideas.. Within this community amazing people where creating a different world, one of hope for the new generations!! 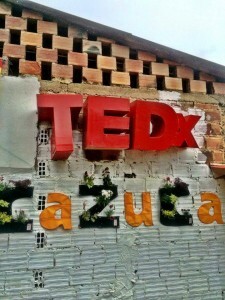 After more than 6 months of hard work, TEDxCazucá came into life. The coaching process was specially difficult, as many of the speakers have never given a talk, and had difficulties to arrange training time. Life is hard at Cazucá, people don’t have the luxury of free time to prepare for a talk, so many times, they couldn’t make it for the coaching sessions. It was, though, a great and rewarding experience. Getting to know this great people, who opened their homes, hearts, and lives to us, convinced on the power of well told ideas to change the world, was a life changing experience! It gives meaning to all what we do when you realize the power of organizing a TEDx event like this one. Being able to put to put the TEDx in the box at the service of communities like the one in Cazucá really sparks amazing processes. When you start to organize an event like this one, with such limited resources, it is wonderful to have the support of the tools contained on such powerful tool. At the end, for this event, we got collaboration from organizations which took care of aspects like sound and videos, but we were assured that logistics where covered, and could focus on working with the community!! And TEDxCazuca begun!! Camilo Rodriguez, a clown working transforming communities through the power of laughing, was the host for the day!! The outer space of the venue was full of expectation! Impact Hub Bogotá was carrying on activities to spark connections between the attendees, while they entered the main venue! Alejo Aponte gave the first talk. A recognized Colombian musician gave an inspiring talk about how mystic and perseverance can make a difference! Then Jhon Bucurú gave a heartbreaking talk, telling how he became an entrepreneur founding an editing workshop, after being a gang member destined to jail or death. Martha Vargas, a self made shoemaker, followed, calling for opportunities for young mothers, through establishing arts and crafts schools to empower and prove subsistence. The break was carried out by two very young magicians, they had been performing tricks before the event at the entrance, and people where curious about where they came from. Then an amazing talk given by William Jimenez, Juan Carlos Montañez, and Brayan Gatay Pérez made the auditorium roar, as they explained how empowering youngsters, through sports, creating wellbeing gangs, and moving aside for younger kids to assume leadership, has created meaningful change in Cazucá! The half time, one of the most important moments at an event like this one, was beautiful. Inspired people connecting with social actors, others with the knowledge to take ideas into action, and yet others with the means to make them happen, is a great recipe for transformation!! Impact Hub Bogotá had handed out formats so people could interview other people, and then connect. At the end of the event prizes to the people with more connections where given to two young women from Cazucá who received entrepreneur workshops at the Impact Hub, and two kids received a day experience at La Juanita Finca Verde!! Traditional food made by the women of the community, a shoe workshop, and an exhibition of recycled crafts filled the space with excitement. The second session started! The host was one of the big stars of the day! He managed to keep everyone entertained and laughing, while at the same time recapitulated precisely the core points of the talks! Carlos Lopez, another magician, revealed the mystery of so much magic going on during the event. He spoke about how magic can break paradigms, a very important issue at communities which are unable to foresee a better future. He trains young kids to be magicians at their communities, providing magic and transformation! Then Nohora Guerrero, with such sweetness and strength started talking about aleopathy, the science which studies how plants take care of each other.. and then related it to the way mothers from the community take care of the children of their peers. The power of watching local people talking to their communities is amazing, it empowers in such a way, it gives so much power to their ideas, and to the neighborhood all together. People believing change is possible at a place where the circumstances denied it from their imaginaries, and hence, their dreams and actions. Julián Lopez de Mesa narrated an amazing story about Cazucá, in which urban farmers created an abundance paradigm uniting chefs from the wealthy sector of the city, with a vibrant Cazucá. The story has not yet happened, but it is starting to happen.. This time the break was amazingly breakdanced by youngsters from Cazucá, which transform violence into virtuosity, with such contagious moves. And then Mono, Boca and Jeje, from 12 Pasos Flow, a hip hop music group from the commune, explained how dreams can be achieved when you keep trying. They started their record studio at a closet they transformed into a mini studio, and now, have the opportunity to run a state of the art recording studio, opening the path to many other artists from the neighborhood!! To close, Daniel Bejarano, narrated how, when his family was killed in front of him, he decided not to follow the vengeance circle which perpetuates violence, but moved towards creativity! He started making movies without any knowledge, and when his films where rejected by the traditional film festivals, decided to create its own community film festival, Ojo al Sancocho, which now is a recognized international festival. And TEDxCazuca came to an end, which is just the beginning. The event itself is just the tip of the iceberg of all the relationships weaved during the process. It is just the start of projects, dreams and actions. The ideas spread are seeds for change, sowed at fields well prepared by the TEDx community now active at Cazucá! !